A NASA submarine is in development that could potentially cross the liquid methane lakes and seas of Saturn’s largest moon, Titan. Although a potential trip to Titan is still decades away, NASA is hard at work developing a potential solution for crossing the methane lakes that currently pose a problem when considering an expedition. The NASA submarine is being developed through a collaboration with Washington State University researchers and will be used in order to determine how the submarine would function by recreating the environment of Titan’s seas in the laboratory. A NASA submarine headed for Titan would need to be able to withstand temperatures of -300 degrees Fahrenheit, as well as prolonged exposure to liquid Methane, reports a Washington State University press release. Titan has been a topic of interest for scientists for many years, because Saturn’s largest moon has an atmosphere filled primarily with nitrogen – similar to conditions here on Earth. Additionally, the moon has liquid, clouds, and experiences rain. Unlike Earth, however, the liquid is made up of methane rather than water. 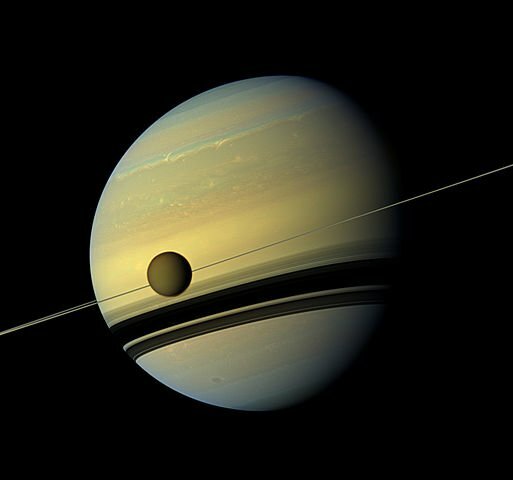 Despite the differences, scientists are under the impression that we can learn a lot more about our own planet by studying Titan with a NASA submarine, and they’ve been collecting information about the planet since 1997 when NASA, in collaboration with the European Space Agency and the Italian Space Agency, launched the Cassini-Huygens mission that arrived at Saturn in 2004. The Cassini-Huygens mission began to make fly-bys of Saturn’s moons, and a year later it landed on Titan. The mission went on for quite some time, finally finishing back in September. Although this most recent mission has come to a close, that’s far from the only activity surrounding Titan. Chron reports that the NASA submarine is just one of several Titan projects that have been being developed since the Cassini-Huygens mission. Another avenue that might produce results is a potential fourth mission in the New Frontiers series of launches being a drone sent to Titan to examine the habitability of dozens of different sites there. If this drone does end up flying, it would launch in 2025 which is still quite a ways away. The NASA submarine, however, has an anticipated launch date that is far later – around 2038, to be precise. In order to take a closer look at the conditions that the NASA submarine might be subjected to, Washington State University built a test chamber with very cold liquid methane, and added a two-inch cylinder that was heated to demonstrate the heat that would come out of the craft. “One of the biggest challenges for researchers was understanding bubbles in the Titan seas. Add a submarine powered by a heat-producing machine into the very cold Titan liquid, and nitrogen bubbles will form…Too many bubbles would make it hard to maneuver the ship, see, take data and manage ballast systems,” said the release. The information regarding the NASA submarine and the findings of the research study was published in the journal Fluid Phase Equilibria.